Have you noticed that your engine is not running as it should and the engine light showing up sometimes? It may be caused by a bad or failing spark plug. The spark plug is a very important component of your engine and it can cause a lot of strange symptoms and even damages to your engine. In this article, you will learn what a spark plug is and which symptoms you should look for when you are troubleshooting your engine for a bad spark plug. You will also get information on the cost and how to replace the spark plug. The most common symptoms of Bad spark plugs are rough idle, rough acceleration, misfires, hard starting condition, poor fuel economy and you will probably experience a Check engine warning light on your dashboard. The Spark plugs are an important part of the engine and it could cause a lot of problems. Because of the importance of the spark plugs in the engine, there could be a lot of different symptoms on a car engine when you have bad spark plugs. I work as a car technician, and I will list the most common symptoms from a car with bad spark plugs. The most common symptom of bad spark plugs is that you will feel misfires from your engine. Misfires can cause the engine to run rough at idle, rough at acceleration and fuel economy changes. The check engine light will probably also show up after a while. You can feel the misfires as the engine will probably running rough and the engine sound may not be as it used to be. When the engine is misfiring, the engine control unit will often recognize the misfire and find out which the misfire occurs on and store it as a trouble code and lighten up the check engine light. That’s why it is a very good idea to read the trouble codes with an OBD2 scanner when you are troubleshooting your car. When a misfire occurs due to bad spark plugs, the unburned fuel may trick the O2 sensors. The O2 sensor will then regulate the fuel mixture and you may get a lean mixture. This can cause rough idle and even more misfires on other cylinders. Due to the O2 sensors mentioned before, you can also get a slow and rough acceleration from misfires and lean mixture. You will often feel this at hard accelerations. Because of the importance of a good spark in the starting moment of an engine, bad spark plugs may cause the engine to not start at all or give you a very long cranking time before it will start. Because of the misfires and the O2 sensor regulations, you can get a poor fuel economy from bad spark plugs. This will most likely not be a dramatic difference, but it can be because a misfire can cause a lot of problems for the fuel mixture. Will my engine get damaged if I keep driving with my bad spark plug? Yes, it will at some point. Bad spark plugs will cause misfires and misfires can cause several problems in the engine. One important thing to take notice is if you have a catalytic converter. The misfires lead to unburned fuel that will blow out through your exhaust pipe. If you have a catalytic converter fitted in your car, the unburned fuel will get stuck there and will get ignited in the catalytic converter due to the high temperature of it. It can cause your catalytic converter to get damaged, and a new catalytic converter can be very expensive. Misfires can also cause a lot of mixture problems with your engine and damage other parts. 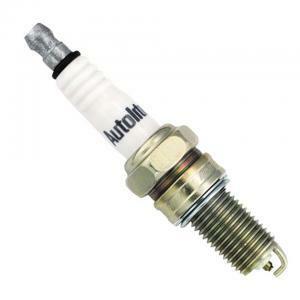 The spark plug is the component of your engine that is igniting the cylinder fuel/air mixture. The fuel injectors are injecting fuel into the combustion chamber and then the piston is compressing the air-fuel mixture. At this event, it’s time for the spark plug to ignite the fuel mixture to push the pistons down. If there is a problem with the spark, the air-fuel mixture won’t get ignited and it will blow out unburned through your exhaust pipe. That event is called a Misfire. You do maybe understand the importance of the spark plugs and why it’s a very important part of the engine to keep in good shape now. The procedure of a spark plug replacement can differ a lot depending on what car model and engine you have. Some are very easy and some engines take a lot more skill to do it. Some V-engines can be very hard to reach the spark plugs but the principle is the same. Refit the ignition coils/cables and all the other required parts. Which Spark plugs are the best? This is a question with a lot of different opinions. If you read the paragraph before, I said that the platinum and iridium spark plugs do have a longer lifetime than regular spark plugs. These plugs do normally have a stronger spark also and are better in most ways. I work as a mechanic and I have not seen any really bad spark plugs on the market actually, but from my conclusion, I can tell you that you should choose platinum or iridium spark plugs if there are any available for your car engine. You will get better spark, lifetime and it will probably also be cheaper in the long run. Bad spark plugs can damage other things in the ignition system like ignition coils and ignition cables in the long run, so make sure that you are not choosing the cheapest plugs just for the price. I have also seen cases where the spark plug split and damaged the pistons and valves, which means that you can expect a repair of thousands of dollars. My opinion is that you should go for Bosch or NGK spark plugs. These are well tested and fitted in a lot of different cars from the factory, which means that they are producing quality and spark plugs that you can rely on. Where is my spark plugs located? The spark plugs can be located on a lot of different places on a car engine, the only thing we can know overall is that the spark plugs are located in the cylinder head above the cylinder combustion chamber. This differs a bit on the car engine manufacturer and the type of engine. These instructions are just general and the information may not be accurate for your car engine. V-Engines have the cylinders in a V and the spark plugs are often located on the “outside” of the cylinder head or on the top of the valve covers. If you have a straight fitted V-engine, check at the outer place of the cylinder head and at the top of the valve cover. If you have a sidewise fitted V-engine, the front spark plugs may be easy to replace, while the rear plugs are pitted against the firewall and there could be the really limited amount of space to replace these. If you have an inline 4,5 or 6 engine you will most likely find your spark plugs at the top of the valve cover. It can also be fitted on the side of the cylinder head (Mostly on older cars). In some cars, you have to remove a cover above the valve cover to remove and replace the spark plugs. How many spark plugs does my car engine have? The first easiest solution to find out how many spark plugs is counting how many cylinders your car has. If you have an inline 4 or V4 engine, you have 4 cylinders and one spark plug per cylinder so the total amount of spark plugs would be 4. But the answer to this question is not really always that simple, because some car’s do have a dual spark system which means that it has two spark plugs on each cylinder. This can be hard to recognize, but the easiest solution to this is to open your hood and search if you can find your ignition cables (Older cars) or ignition coils(Newer cars). This is often fitted directly on the top of the engine, in some cases, you have to remove a cover to see how many cylinders you have. By checking the picture down below, we can figure out that these inline 4 cylinders have four ignition cables, which means that there are 4 cylinders and 4 spark plugs on the engine. The terms “inline” and “V-engine” is based on the structure of the engine. An inline engine does have all engines fitted in a line. V-Engine has the cylinders fitted in a “V”, that’s where the term comes from. A V-engine can look like there are two inline engines fitted into one engine. The benefit with a V-engine is that you can build the engine much shorter, but wider to create more space and fit better in the hood if you have a lot of cylinders. An inline engine is often much more balanced and creates fewer vibrations than a V engine. But this can be discussed in ages because there are a lot of V-engine fans out there which will discuss which engine is the best in overall. Really Split opinions about this. There are also car’s with boxer engines, like Subaru. These engines are having the cylinder heads straight to the side and you can say that the cylinders lie down.
. Just make sure that you choose the right spark plugs for your car engine. The next thing we have to consider what types of spark plugs you need for your engine. The best way to know this is often to call your authorized dealer and ask them which spark plugs you need for your engine. You can also check in your repair service manual. Another way is to remove the spark plugs from your car first and check if you have platinum plugs or not and check the part number on them. By ordering the same part number, you are sure that you will get the right spark plugs when you are ordering it. The difference between normal, platinum and iridium spark plugs is the type. Check the electrode at the bottom of the spark plug, if it’s formed like a box/cylinder you do most likely have normal spark plugs and if it’s sharp V-shaped, you do most likely have platinum or iridium plugs. Platinum and iridium plugs are more expensive than regular spark plugs, but they are having a longer lifetime. Normal spark plugs do normally having a replacement within 50000km’s while platinum or iridium have a replacement maintenance of 90000-120000km’s. Consider that you have a normal spark plug and the price is 10$ each and are running a V6 engine, the price of the spark plugs are going to be 60$. The labour cost differs a lot in different car models. In some cars, you can replace the spark plugs within 10 minutes and some does require a couple of hours to do the job. But the most common labour cost of a spark plug replacement is around 50-150$ for the most cars. First, you should check what spark plugs you have. There are several types of different spark plugs on the market and to figure out when you should replace your spark plugs, you have to find which model you have. There are 3 main different spark plug type to be aware of. The first, most common is the Regular Spark plug which has the shortest lifetime and it’s the cheapest spark plug. Some newer models with a longer lifetime are the platinum and iridium spark plugs. Platinum and iridium spark plugs are often better in the most ways, they have stronger spark and a longer lifetime, but are often more expensive than a regular spark plug. To recognize what spark plug you have, you can check the tip of the spark plug in the picture above. 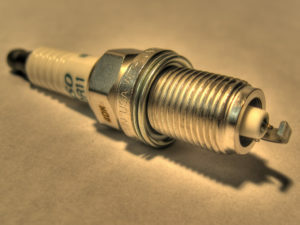 Regular spark plugs have a wider tip when an iridium or platinum spark plug does have a smaller tip. In the picture down below, you will see a platinum or iridium plug and a regular in the picture above. You can also check the part numbers on your spark plugs and search for information to find out what type you have. The best way is always to call your authorized dealer. Installing wrong/too long spark plugs can cause serious damages to your engine. Always double check and get the right model for your engine. When should I replace my spark plugs? In the table above, you will find a general information on when you should replace your spark plugs depending on what types of spark plugs you have. My recommendation is to always check in your Service Manual or call your authorized dealer to get the correct information of when to replace your spark plugs in your car model and engine. Car manufacturers do have a scheduled service for a spark plug replacement and it depends on the car model and engine. The list above is just a general list of what the most common replacement time is for the specified. Spark plugs can get bad/worn out before the recommended time also. There are several symptoms you can check for if you suspect that your spark plugs are bad. Some of the most common symptoms you will find down below. 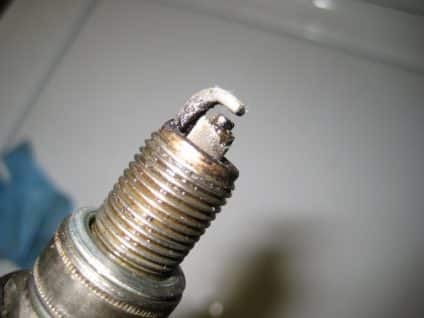 You can also check out our other article Symptoms of bad spark plugs. Do I only have to consider the regular or platinum when buying spark plugs? No, you have to make sure the spark plug length and threads are the right for your car model. If you check the links above to Amazon, you can select your vehicle in the list above to make sure the spark plugs to fit your vehicle. My recommendation is to always call your authorized dealer to get the right information of which spark plugs you should use. Because the spark plugs are fitted in the combustion chamber where the piston goes in your engine, you have to be very careful to not install the wrong type of spark plugs. Too long spark plug threads can hit the pistons and damage them seriously and it would be a very high cost to fix your engine. So you can never be too careful when installing new spark plugs. Now there is a lot of information in your head, so we will take a small summary of this article. There are two types of car engines Inline or V-engine. 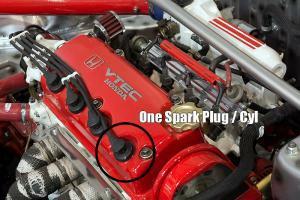 It doesn’t matter if you have an inline 4 or V4 engine, both have 4 spark plugs (If not dual ignition). Choose platinum or iridium spark plugs if there is any available for your car. A replacement cost of a spark plug replacement can differ between 90-500 dollars. Even more in some car engines where the plugs are difficult to replace. Check the length of the plugs before installing your new plugs. If you have anything you want to add to the article or tell your own story about when you replaced your spark plugs, comment down below. If you have any other car questions, you can use our search function and probably find the answers you need from a real mechanic!